Camions Laguë | Camions Laguë inc. and Location de camions Eureka inc.
▪ April 1977 – Beginning of the construction of the Boucherville location, at 1410, boul. de Montarville. 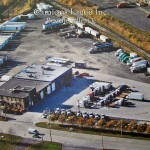 ▪ October 31st 1977 – Official opening of Camions Laguë inc. as an International truck dealer. ▪ 1980 – Extension of the facilities in Boucherville, going from 8 service doors to 28 service doors. 30 employees. ▪ 1982 – Creation of Ressorts Boucherville inc.
▪ 1986 – Creation of Location de camions Eureka inc.
▪ 1992 – Acquisition of the Anjou location. Today Anjou is a SAAQ Road vehicle inspection agent. ▪ 1994 – Transfer to a Paccar dealership: Peterbilt and Kenworth. This time as a PacLease concession, full service lease and truck rental. ▪ 1994 – Acquisition of the Dorval location. ▪ Years 2000 – Creation of Transport Eureka inc. to deal with Rona’s logistics, among others. 150 employees in 3 locations. ▪ 2002 – 25th anniversary of Camions Laguë inc. Large marketing campaign to promote the various specialized vehicles available at Camions Laguë inc. / Location de camions Eureka inc. : garbage trucks, yard tractors (shunter), straight bodies with reefer, crane trucks etc. ▪ 2004 – Sale of Ressorts Boucherville inc. and Transport Eureka inc. And the service division of Dorval. Now 40 employees in 2 locations, and 2 affiliate partners. ▪ June 2010 – Boucherville location is moving to 205, ch. du Tremblay. The administration is brought back to Boucherville (they were moved in Anjou in the 90’s). ▪ Today we are 60 employees in 2 locations + 2 affiliate partners: Ressorts Boucherville inc. (bodyshop and suspension) and Camions Laguë Dorval inc. Our services: Parts, truck maintenance and repairs, road service, Kenworth leasing through PacLease and truck and trailer rental through Location de camions Eureka inc.